I often felt that when he wasn't in his dishdasha, his ways where much more casual, his questions more unassuming and random. Perhaps that's why when my ex boss asked me what my favorite last meal would be, I wasn't surprised. Or it was because he had recently learned about me being a food blogger, I'm not sure. Without the usual 'what would be the best answer to this' approach - I unhesitatingly answered roasted chicken. I knew immediately I have disappointed him with the answer. It wasn't a fancy lobster dish like his, it wasn't even a unique Indian recipe, it was just roasted chicken. For days, I kept thinking back to my answer. I didn't get a chance to explain my answer to him but it was an explanation I owed to myself. The reassurance that I didn't need a fancier answer. A real home cook would know the warmth and comfort roasted chicken brings. And why would someone have anything but warm and comforting on deathbed? Having said that, roast chicken is probably a generalization in my mind of chicken cooked whole. I grew up on tandoori chicken on the grill and steamed whole chicken stuffed with eggs or coriander leaves like this one. 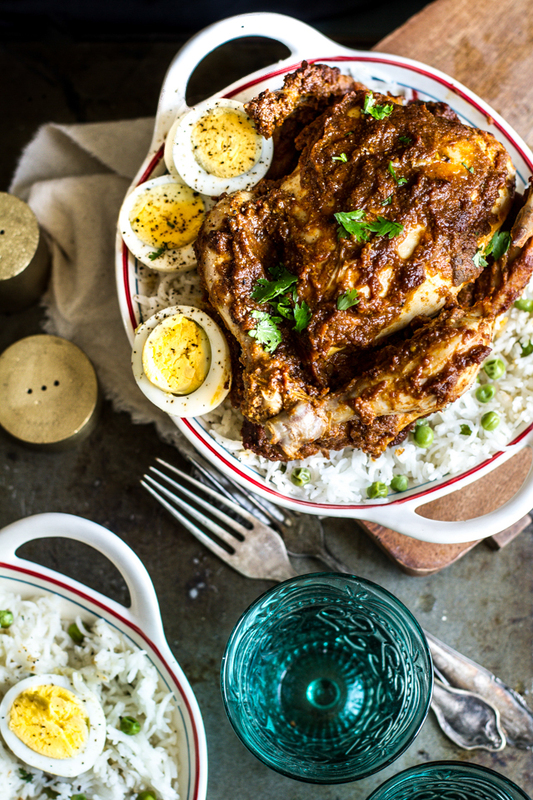 The chicken is spiced generously with base of yogurt, onion and tomatoes which cling on the meat as the chicken cooks in the masala and it's own stock. The light browning of the chicken and then the reduction almost caramelizes the tomatoes leading to deep and intense flavors. You can easy turn this into a roast chicken recipe which I often do when I don't want to be around the stove. 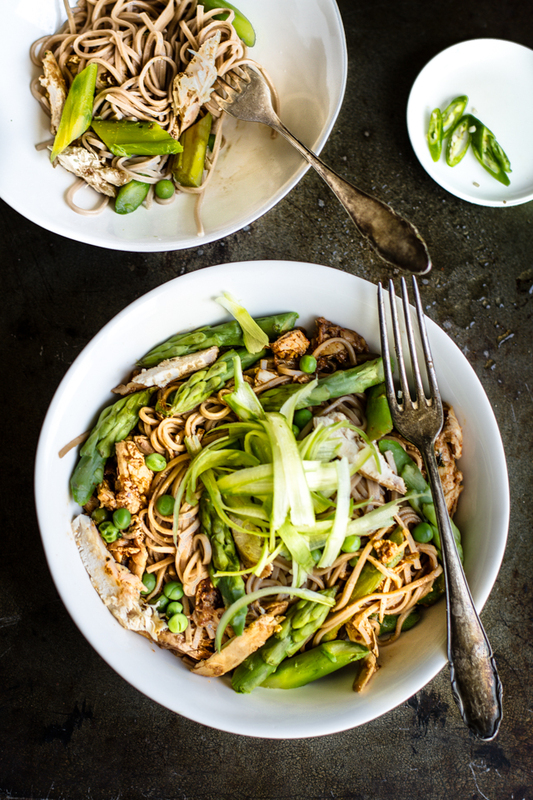 We added the leftovers to ginger and soy dressed soba noodles, asparagus and sweet peas which turned out to be one good lunch. Marinate the whole chicken 2 tbsp ginger garlic and chilly paste overnight. Lightly roast the almonds, poppy seeds, coriander seeds, cloves, cardamom pod, cumin seeds and red chilies in a dry pan. Grind to a paste along with the fried red onions. Mix this paste with the yogurt and the remaining spices. Grind the tomatoes into a puree. And mix in the tomato paste. Cook this mixture until its halved. Let is cool and mix it with the yogurt mixture. Slather the mixture all over the chicken and stuff some of it into the cavity. Heat ghee in a wok or deep saucepan and add the chicken. Let it lightly brown on all side. Reduce the heat and add about 1/4 cup water, cover the cook the chicken until its tender. There is a lot of moisture in the marinate and yogurt to keep the chicken from sticking to the bottom but every 5 minutes keep a check on the chicken and splash more water if required. If you want more gravy add more water. I wanted this to be on dry side so once the chicken was cooked, I uncovered the chicken and let the sauce cook until all the moisture evaporated and the remaining sauce was slathered back on the chicken. Serve with Mattar Pulao (recipe below) and boiled eggs. You can cook this in a pressure cooker which cooks faster of course. Also, you can bake it in the oven instead of steaming. Throw in some curry leaves while it steams to add a different flavor profile. If possible soak the rice in water for couple of hours. This creates fluffier rice and shortens the cooking time. Heat ghee in a deep saucepan, and add the whole spices. Once they splutter (making sure not to burn them! ), add the peas and saute them for few seconds. Add the rice followed by water and bring it to a boil. This looks sooo delicious. And a new way to me - cooking the masala and then slathering it.Yum! I made roasted cornish hens last Thanksgiving & what a delight they are when you roast the whole bird. Never did chicken though. This looks delicious. I love the photos and the aromas they conjure. They are all beautiful but I especially like the photo of the whole chicken garnished with eggs. And, yes, I am with you. Roast chicken, done well, is the ultimate comfort food. Well done. Mouthwatering! A fantastically fragrant dish and gorgeous way of using the leftovers. Kulsum, everything looks so delicious! My eye is really set on that roasted chicken with rice. 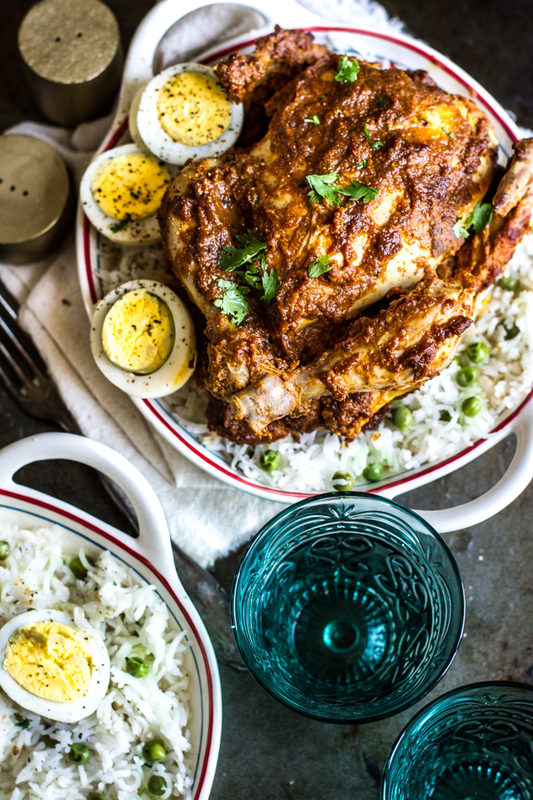 I've made this a few times, the recipe I've used is from Madhur Jaffrey and has one sauce to marinade the chicken in and another, different sauce to cook the chicken in. It always turns out so wonderful. I'm looking forward to trying the version you have provided as well, I think I will make it tomorrow, yummmmm! Thank you! This is definitely something I'm not used to making but hey, the way you made it looks is super tempting. This would be a stunner when you bring to them at get together. Cooking the masala before smearing it sound very nice too. Lovely pictures. This looks so beautiful and flavour-balanced. I am bookmarking to make it this weekend, with the peas and rice (baked). I can almost smell the spices from here! Roast chicken looks fancy enough to me. It is one of the most satisfying things ever! This looks insanely good! Love the flavors, clicks and presentation! Beautiful!!! You know K you will laugh but if someone ask Adil (my hubby) about what his favorite last meal should be he would say Roasted Chicken in a breeze... as you say the warmth n the comfort attach to this beauty can never go unnoticed. ..
Beautiful bird you have here... im getting so hungry for this baby now.... Gorgeous Pics As Always! The Murgh Musallam looks absolutely awesome. had eyed it on your Instagram a long time back. Doesn't a stuffing go into Murgh Musallam? On a different note, is there a Bohri Biryani? I believe that there is and you put eggs in that Biryani too, just like the one that is made in Kolkata. Oh wow, this chicken is absolutely gorgeous. I love all things curry but I've never seen it done like this with a whole chicken. I need to do more research on Indian cuisine because I'm just in love with it. Hi Kulsum - this looks so good! Quick Question - what kind of chilly do you put in the ginger garlic paste? red or green? And you marinate it over night in just the ginger garlic chilly paste?